I am being threatened by a content thief! Yesterday I came across a person claiming to be Wing Commander Partha De Sarkar, who also claims to be the owner of Ladakh India Tourism, Global Hop Travels India and Global Hop Travels. 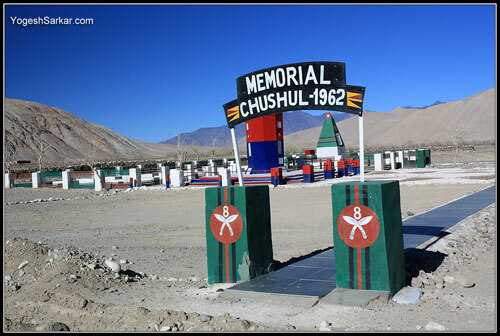 Partha De Sarkar had stolen a photograph of Chushul War Memorial, which I had captured during my trip to Ladakh in December 2011 and was using it in a bid to promote his Ladakh India Tourism Company on Facebook. When I politely asked him, who gave him the right and permission to not only use my photograph, but also crop out my copyright mark from it, Wing Commander Partha De Sarkar not only started telling me how great he was for participating in Indian Air Force during 1966 and 71, when I wasn’t even born or was probably in my nappies, but he also claimed this photograph was clicked by him. Add to that, Wing Commander Partha De Sarkar of Ladakh India Tourism, Global Hop Travels India and Global Hop Travels also started using abusive words against me, for being a civilian, which seeing from his conduct, has no right or dignity in India! He also accused me of being a thief tour operator and cheating many people, even though I have never taken a single paid tour or sold any travel services to anyone in my life! 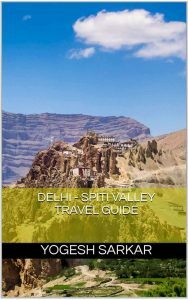 In fact for the past 7 years, I have been freely helping people plan their Ladakh journey, through this blog, BCMTouring and various other online forums and social media sites. Heck the idiot that I am, I have even gone to extent of spending my own hard earned money to meet and help out fellow travelers, and here I was being accused of scamming people by the owner Ladakh India Tourism, Global Hop Travels India and Global Hop Travels, who was using my photograph to promote his business on Facebook. In fact majority of the photographs on his profile seemed to have been stolen from elsewhere, a theme also clearly visible on ladakhindiatourism.co.in as well! While there has been an out pouring of support from friends and even friends of friends and fellow travelers, bikers and photogs, I am still in too much of a shock to comprehend the situation. 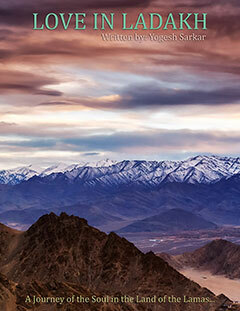 I mean, as a victim of Copyright Infringement, I not only have to go through the pains of getting that photograph removed from Facebook, but I also get abused by a supposedly retired Air Force Officer with the threat that Indian Air Force and Army will create problems for me or teach me a lesson, if and when I visit Ladakh? Do I deserve this this abuse and threat because I am a civilian? Or do I deserve this abuse and threat because I felt proud of the Indian Army Jawans who were martyred during the 1962 Indo-China War and hence felt compelled to not only visit Chushul and Rezang La War Memorials to pay my respect, but also tried to capture them through my lens, so that I can tell my fellow Indians the story of their sacrifice and valor, and ask them to visit these monuments of martyrdom and also pay their respect to the true heroes of the nation? Or do I deserve this abuse and threat, because I am stupid enough to help people out, without charging a single rupee (unlike honorable Wing Commander Partha De Sarkar of Ladakh India Tourism, Global Hop Travels India and Global Hop Travels) and going out of my way to promote tourism in Ladakh for no selfish reason? Whatever might be the reason for deserving this abuse and physical threat, Wing Commander Partha De Sarkar has caused me to introspect and question the wisdom of helping others out for free, in a world full of petty politics and selfish commercial gains. Ps. this isn’t the first time I have faced abused for asking a content thief to remove my photograph or content, however this is the first time I am actually being physically threatened for asking the removal of a photograph, shot by me. Update: Partha De Sarkar seems to have disabled his Facebook Account for the time being or has changed its URL, however he has neither apologized to me or the other photogs, nor had he deleted any of the images in question. 4 comments in less than half an hour, ranging from threatening, compromising, once again showing connections and wishing well. Wow, not even political parties change their statements so often and fast! Rajiv and the funny bit is. He has gone from the claim that he was the one who shot the photo to it was shot by some Allen Craig to the photo being “Internationall Circulated” (whatever the hell that means!) And to think, all he had to do was say that he was sorry about having used my photograph without permission and this silly episode would have been long over or might not have begun in the first place! Heck the idiot I am, I am still ready to forgive and forget for the past, if he shows the decency to acknowledge his mistake and apologizes! Oh well, back to the regularly scheduled restatements of Honorable Partha De Sarkar. You know what? You take it in writing from me. We are not going to ‘excuse’ him until he publicly acknowledges his mistake and apologises OR shuts his shop and leaves!! This whole episode has pissed me off to an unexpected extent! I get the same vibe Rajiv. Kumar it isn’t a matter of me forgiving him, since he is the one repeatedly coming to my blog, to issue threats and tell new lies. I could have taken this chap to court, filed an FIR for issuing threats online, complained to LAHDC, had this matter covered by newspapers (friends working for newspapers advised me to do so), dropped names of individuals and agencies big enough to make anyone quiver, launched a social media campaign against him, his business and his business partners or tons of other alternatives present to make him pay for his deeds! However I haven’t done any of that, in fact I haven’t even spoken about him in an ill manner, let alone stoop to his level of name calling! Yogesh, I told you I am of your father’s age. Please forget and forgive. Hahaha! Here you go!! All I can say is, the dignity og an old man cud have been saved by himself! Partha De Sarkar, I am ok with it, as long as you don’t copy any more of my photos without permission or comment any further on my blog or threaten me in future! A gentleman always speaks like one! Question does not arise. I had certain pressure and I did not think with clear head. Anyway, I may refer companies from Australia and Argentina bike tourists to you. Though I am abroad, I still get requests from many places to organize tours. I hope you will handle those. And another request is please remove this blog. First of all, I am not a travel agent. Secondly, sorry, but this blogpost isn’t going to be removed. Ok, do not remove and thanks for kindness! !